I have been working as a tour guide in the historic town of Deventer for over twelve years. Over the years I have expanded my work as a tour guide to include tourist attractions such as Kinderdijk, Gouda, Amsterdam, Palace Het Loo, Giethoorn, and museums such as the Kroller-Muller Museum and the Rijksmuseum. The tours are open to all, but group tours or other special programmes can be arranged. I look forward to seeing you on one of the tours. Historic walking tour: the Bergkwartier. Deventer became a member of the Hanseatic league in 1285, making it one of the earliest participants in this famous economic alliance. This historic walk takes us past many beautiful historic buildings from this period (13-15th centuries). Among the many interesting sites are the Muntentoren (Mint tower), the Bergstraat and the Bergkerk (Hill Street and Church), the Roggestraat (Rye Street) and the delightful Walstraat. The walking tour ends at the Brink, the central market square, with its stunning Waag and the treats of the “ Deventer Koekwinkeltje” (Traditional shop selling the famous Deventer cakes). Please click for reservations or questions. The church in fourteenth century Europe was in a state of turmoil. Bishops vied for power and wealth with secular rulers and priests had wives and children. In many places in Europe, reformers were calling for a return to the core values of Christianity. One of the most influential reformation movements was based on the teachings of Geert Groote from Deventer and is called Devotio Moderna, or the Confraternity of the Common Life. It spread throughout northern and western Europe and attracted many followers. Marten Luther, for example, studied with the Brethren at Magdeburg. This tour will lead us past the buildings in which the different communities of supporters of the Modern Devotion lived and worked: the Broederenkerk (Church of the Brothers), the remains of the Ursula Chapel, the Geertshuis, the Stappenconvent, the Buiskens and Agneskloosters (former Modern Devotion monasteries), the Old Church of Mary, the Lebuinus Church and the Latijnse School (Latin School). The 1.5 hour walk also takes in the site of the former Florens Radewijnshuis (named after Geert Groote’s successor), the Lamme van Diesensquare, the Holy Spirit or Grote Gasthuis and the Brink (the central market square). All these sites and buildings help bring back to life the story of this remarkable period in the history of beliefs. Between 1450 and 1500 almost 2% of all books in Europe (an estimated 27000 titles) were produced in Deventer. The supporters of the Modern Devotion played an important role in this production boom. In modern times, Deventer has featered in the works of many authors, such as Etty Hillesum, Annie M.G. Sschmidt, Drs. P, Maarten ‘t Hart and Ida Gerhardt. This 1.5 hour walk will take in the Berglkerk, Bergstraat, Roggestraat, Mint tower, brink, wag, Assenstraat, Polstraat, City Hall, Latin School, Grote Kerkhof and Lebuinus Church. The extended tour of 2 hours also leads past the Old Church of Mary, the river IJssel, de Kranensteeg and the Atheneum Library. During these walks some poems Deventer will be recited. 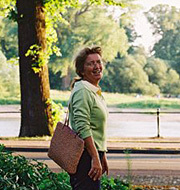 All walking tours can be held in Dutch, German, French or English. Groups consist of a maximum of 20 people. Walking tours can be arranged every day of the week except Saturdays. Price on request. - Every tour description is followed by a link. You can book a walk though this link and will receive confirmation of your booking the same day. - A copy of the terms and conditions will be sent to you along with the booking confirmation. - Once Annemieke Brouwer has received your signed booking confirmation, the booking is final.